Aft view should not be this obstructed. 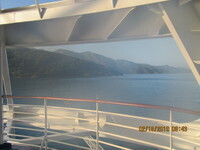 The Room was nice, very large balcony BUT a bad view due to the configuration of the rear of the ship. this was an obstructed view and not stated as such when being sold. the aft view cabin on this cruise is not worth the upcharge. the bathroom door would not close properly. had to push in it to latch. it was like the door was sprung. maintenance did adjust but it still persisted.